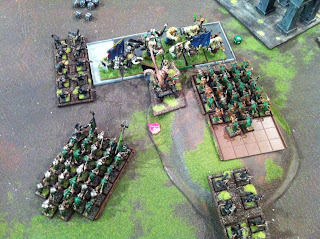 I set my deployment with Slaves in range of the General and BSB as usual, but the Storm Vermin were on the far flank to capture the table quarter for the scenario. They were also behind the hill and would be protected from the charge of the Mournfang for as long as possible. They also got the Brass Orb as added Mournfang defense until I would be able to shoot at them with my cannon. Starting off by stealing the roll for the first turn without the +1, I was able to put 3 wounds on the Ironblaster but not finish it off. 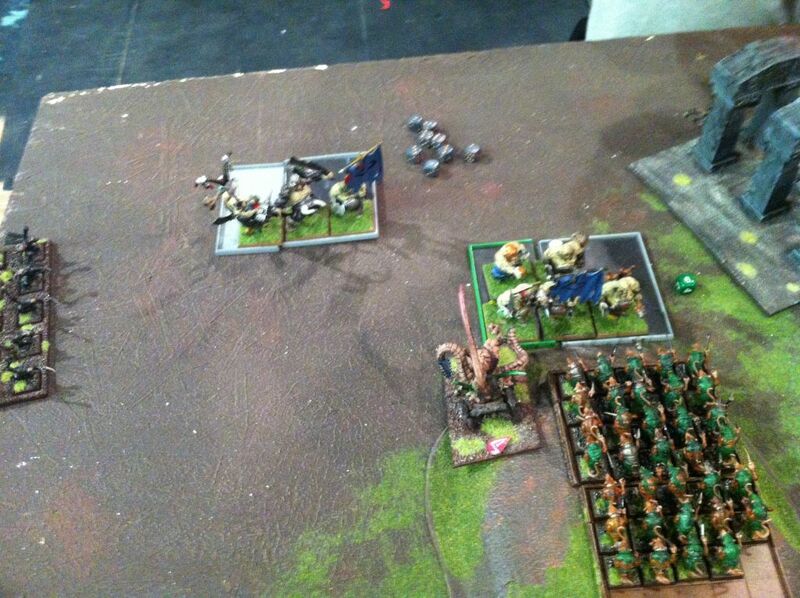 I also killed a Sabertusk in the Ogre midst to force a panic check, but did not panic off any Ogres. I still don't know why Ogre players put cats in range to cause panic, but I see it time and time again. The Ogres come back by charging Gutter Runners, who flee successfully, and hitting the Abom with the IB but only doing 1 wound. 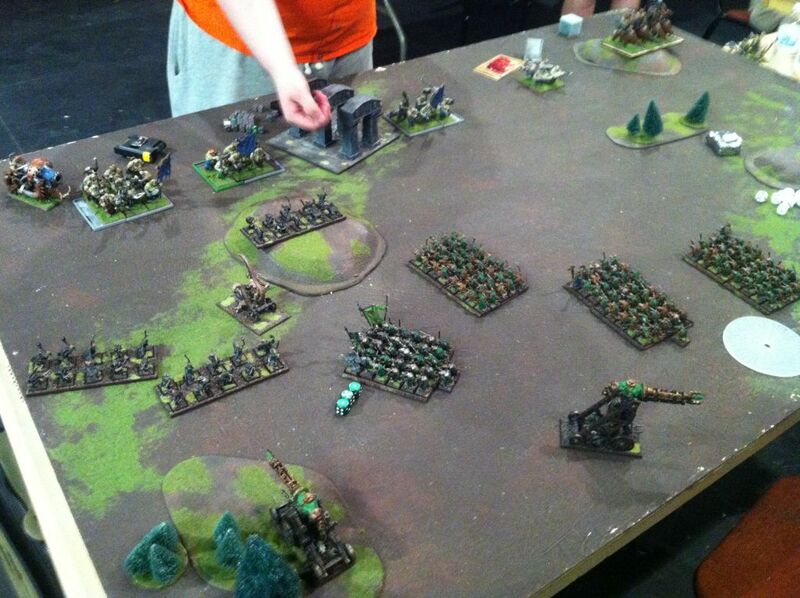 On the second turn the Skaven started to light it up. In the magic phase, a Skitterleaping Grey Seer kills 2 Mournfang and 2 Leadbelchers on the right, while shooting from the Gutter Runners finishes the Ironblaster. 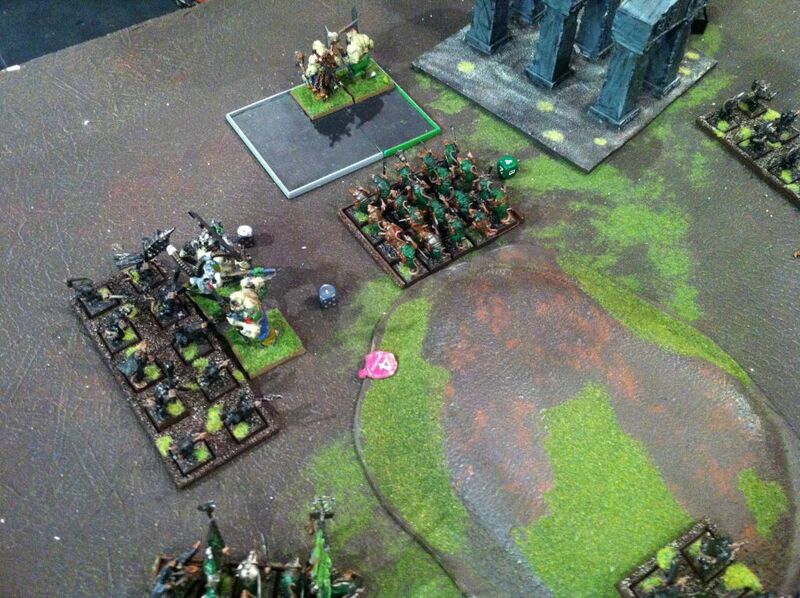 The Warp Lightning Cannons turned on amazing mode, with the first killing 6 Ogres, and the second killing another 4 with 2 shots. The Abomination and Slaves charged into some more Ogres and kills a couple, but they hold... to be charged by the general the next turn. 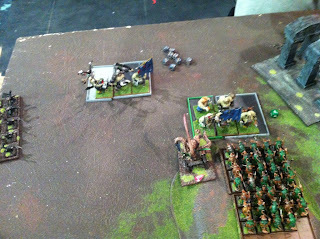 While prolonged combat goes on, my second Grey Seer cascades off the board in order to finish off the last Mournfang. I would have preferred to kill them without dying, but I'll take it! The Hellpit is killed in combat but the combat is won and the Slaves run the Ogre block off the board, as the General and BSB stay to fight the flanking Gutter Runners. The Gutters kill the BSB before the General runs them down, only to have the General fail 2 Blood Gruel tests in a row to kill himself the next turn, as the remaining Butcher from the Ironguts is killed as he flees in the middle of the board. This pretty much ends the game as the Gorger finally comes on and kills a cannon, but much too late to effect the outcome. I end with a max win, and start climbing back up the tables. 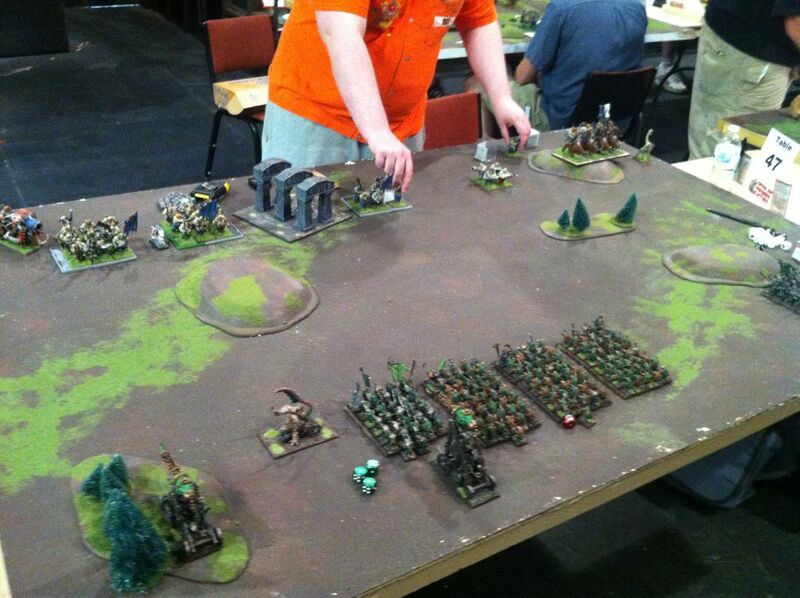 Tomorrow for game 3 I am matched up with Ogres again to try and keep rising in the standings.